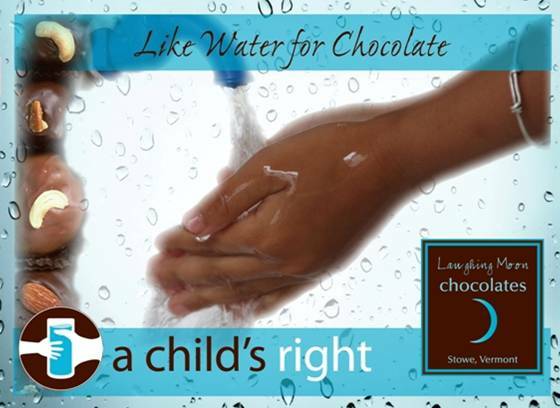 Laughing Moon Chocolates is committed to social responsibility, environmental stewardship and to creating a healthy local food system. Most of our packaging is now compostable, including our clear cellophane bags and ribbon which is 100% cotton and made in the USA. Our boxes are made using 100% post-consumer waste paper which is manufactured using wind power in New York State by Mohawk Paper Company and are printed with soy based inks. We strive to support local businesses. We are members of the Vermont Fresh Network and are a pick-up location for Pete's Greens Community Supported Agriculture Program called Good Eats. Since 2009 we have been conscious of the ways we can reduce our impact on the environment while impacting our local economy and food system in a positive way. We now ask ourselves two questions about every product: Can we make it ourselves and if not, can we source it locally? We use as many locally made products as possible in our chocolates and it has made a terrific difference in how we feel about our product. For example, we no longer dip Oreo cookies. Instead we dip ginger, vanilla and chocolate cookies baked for us by Sweet Crunch in Hyde Park, Vermont. Other examples of local products we incorporate in our chocolates include Vermont Peanut Butter, Mitzi's Granola, Nutty Vermonter and Slopeside Syrup. We use locally made liquors to flavor our truffles, including Green Mountain Distillers Sunshine Vodka and Maple Liquor. We also make our own homemade marshmallows and caramel!